We were delighted to support a business breakfast recently with the special guest speaker Economist, Jim O’Neill, Lord O’Neill of Gatley. The event was attended by over 100 guests from the business community, and raised nearly £10,000 for MedEquip4Kids. Once breakfast and coffee were served, MedEquip4Kids chairman Brian White welcomed Lord O’Neill and gave a brief introduction to his many impressive achievements. After graduating from Sheffield University, Lord O’Neill studied for a PhD at Surrey and went on to become a renowned economist, working for various banks including 15 years at Goldman Sachs Division of Asset Management. He is especially well known for developing the acronym BRIC (Brazil, Russia, India and China), a group of countries considered to be at a similar stage of newly advanced economic development. In 2011 he was named by Bloomberg Markets magazine as one of the 50 most influential financial professionals worldwide. When Lord O’Neill left Goldman Sachs he had a desire to do something different, though he wasn’t sure at first what that would be. Then he was asked by David Cameron to lead a review into the problem of antimicrobial resistance. His wife, who is a scientist, commented that it was the first time she’d be able to understand and be interested in what he was doing! Lord O’Neill has subsequently co-written a book called Superbugs: An Arms Race Against Bacteria. After the talk the floor was opened up for the audience to ask questions. Perhaps unsurprisingly in the circumstances, the first topic to be raised was Brexit. Lord O’Neill’s view as a remainer was that there were likely to be negative consequences of Britain leaving the EU, but it perhaps wasn’t the most important issue facing the UK economy at the current time. In fact it was possible that increased productivity could eventually make up for any negative impact of Brexit. But in order to achieve that productivity, it was crucial to tackle geographical and intergenerational inequality – factors he believed were responsible for the referendum result, especially in places like Sunderland where people had felt for decades that they were being left behind compared to other parts of the UK. This led on to the subject of the Northern Powerhouse, an initiative which Lord O’Neill has championed and remains heavily involved in. In his opinion the six key factors in regenerating the northern economies are: devolution (in particular healthcare – he mentioned that in areas of North Manchester the life expectancy for men is just 59 years old), transport, education, skills, businesses moving out of London to prevent young people in the north having to relocate for jobs, and backing from private sector and council leaders. Finally Lord O’Neill was asked about the best emerging markets for UK exports, and he emphasised the importance of China. Although its growth has slowed recently, it still creates an equivalent of the South African economy every month. One important area is Chinese consumers: Apple now sells more iPhones to Chinese customers than it does to US ones. Other key emerging markets he noted were Vietnam and Laos. At the end of the breakfast Lord O’Neill, who is an enthusiastic supporter of Manchester United, drew out the winning envelope from the prize draw. 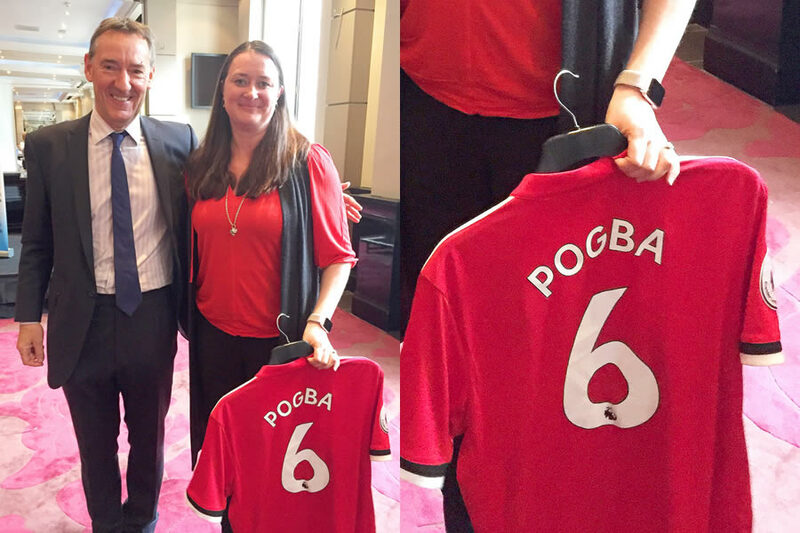 The lucky winner was our very own Becky who went away with a Paul Pogba shirt!